Public attention has recently been drawn to the global plastic crisis and the need for change. While a large part of this responsibility lies with large companies and the government, there has also been an increase in individuals who are cutting out plastic use and even becoming zero-waste in an attempt to use their power as consumers to be part of the solution, rather than the problem. With this in mind, we challenged two of our enthusiastic ambassadors, Emily Watson-Breeze and Charlotte Chivers, to give up single-use plastic for a week and see what they learned — read on to find out about their experience! What were you hoping to achieve through doing the plastic-free challenge? Emily: A deeper understanding of why we’ve become so reliant on single-use plastics (particularly in Western society) and how far sustainable alternatives have been produced and supported by people in positions of power/influence. Charlotte: I wanted to observe the extent to which typical supermarkets (alongside independent shops) have progressed since the public outcry after Blue Planet aired an episode showing the extent of plastic pollution in December 2017. I also wanted to see whether eliminating single-use plastic could be achieved affordably in terms of both time and money by a typical consumer with a busy lifestyle and little routine. What were the most significant changes you had to make? Charlotte: I couldn’t shave my underarms! I know there are alternative ‘plastic-free’ razors available but the heads would still need changing often and I couldn’t find a particularly affordable option. If anyone has any suggestions, please let me know (bearing in mind I’m too wimpy to wax!). I also couldn’t access many of my usual food choices so had to improvise with whatever I could find. However, a lot of the plastic free options are typically healthy (fruit/veg) so this wasn’t a particularly bad thing! How did it affect your everyday life? Emily: As a mad chocoholic, realizing that most shop-bought chocolate is mainly packaged in single-use plastic put a stop to my daily sugar fix as only more expensive brands wrap their products in sustainable products, most commonly cardboard. This led me to take my custom to my local farm shop where all of the produce is wrapped in paper bags, enabling me to also contribute locally. Charlotte: I live a relatively busy life (juggling a full-time PhD, a job, volunteering, and a personal life) and I don’t always have access to a kitchen when I’m away with work. This made it really difficult as I often do have to grab convenience food if I don’t have the time/agency to cook. I quickly discovered that bananas and tinned soups are an easy way to grab lunch! Emily: After being brought up with a ‘waste not, want not’ attitude, I’ve always liked to give back to the environment by composting. However, prior to this week the irony of veg being predominantly packaged in plastic had never occurred to me. Charlotte: I was really surprised to find that it’s extremely difficult to grab food on-the-go. It was very surprising to see how difficult it was to find convenience food that isn’t covered in plastic as a huge proportion of the population are reliant on this. I’m not just referring to unhealthy ready meals here but also fresh salads and healthy ready meals (e.g. Bol, Innocent)! In an ideal world I’d prepare food from scratch every day and have rigid meal plans, but in reality I simply don’t have time under my current circumstances. Are there any products you used which made it easier? Charlotte: I used Beeswax wraps to grab loose bread rolls, although I have to admit I’m slightly disappointed; they make your food smell like honey (which isn’t always desirable! ), and they deteriorated after the first wash even though I followed the instructions. I think in future I’m going to attempt to make my own as it’ll be much cheaper and I can ensure they’re more robust. Now for my favourite discovery…. 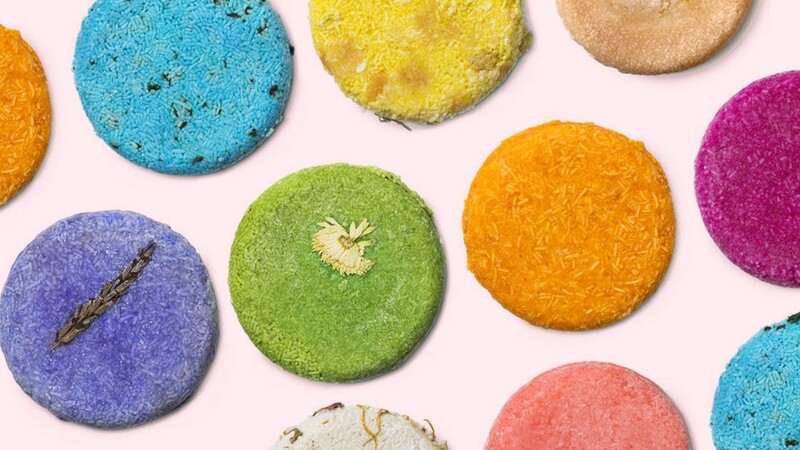 Lush shampoo bars. They smell divine and my hair feels just as good as with traditional shampoo (if not better). I’m really impressed with these and recommend stocking up; also, make sure you get one of their handy tins to keep them in. I also tried their conditioner bars and sadly they’re not quite as good as they don’t break down easily enough, although it’s worth it once you do manage to get some into your hair! I used a mixture of shops to find plastic free items, including local groceries and organic health shops (Bristol is great for both of these but bear in mind not everywhere has decent options, and most are closed outside of normal working hours!). Did you ever mess up? Emily: Yes — after becoming accustomed to the ban on plastic straws at Uni, causing me to frequently use cardboard ones, I candidly picked up a plastic straw at the cinema subconsciously. This reminded me that although some companies have banned plastic straws in a bid to cut back on plastic in the UK, an idea brought to the forefront of environmental discussion in the media in 2018, there’s still a long way to go in order to achieve a united stance. What was the strangest thing you realized had plastic in it? Emily: Having originally thought that my Grandma’s strong dislike for modern clothing, particularly polyester, was because she is stuck in the golden age of cotton and wool, it became apparent to me during this week that there was more to her hatred of modern clothing than originally meets the eye. Most man-made clothing materials are not biodegradable and can take as long as 200 years to decompose. In the future I will definitely try to avoid buying these sorts of fabrics and take any existing clothes to charity shops or other organisations which can keep them in circulation for as long as possible. Charlotte: I discovered this before my single-use plastic week, but I remember being very shocked when I realized that most tea bags contain plastic! What was the strangest thing you did or used to avoid using plastic? Emily: When ordering a pizza which I happily knew would arrive in a cardboard box, I struggled for several minutes explaining that I didn’t want the little plastic support that holds up the cardboard box. As a little heads up for those of you who don’t want to embarrass themselves on the phone, I’ve now learnt that the plastic device is called a “package saver”! Charlotte: My partner likes to have sandwich meat for his packed lunches, all of which typically come in plastic. I ended up taking a Tupperware up to the deli counter in Sainsburys and asked them to slice some into there. It turned out well and the butcher wasn’t at all awkward about it! Are there any plastic-free changes you’re going to keep up after the challenge? 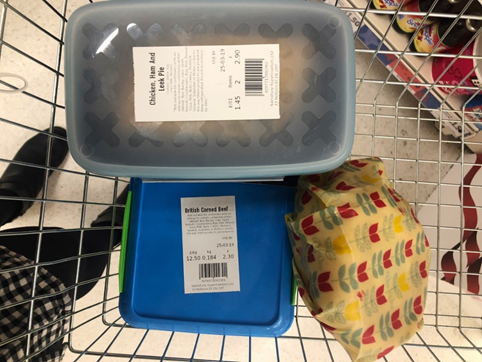 Emily: General changes like always carrying around a bag for shopping, shopping locally where possible and making my own food at home to prevent buying ready meals on-the-go are all changes that I’ll incorporate into my everyday life after this challenge. Charlotte: As many as I can! I’ll definitely continue using shampoo bars, taking Tupperware grocery shopping, using reusable sanitary products, and supporting my local independent groceries (which I already did anyway). However, I have accepted that I will still have to rely on single-use plastic to an extent, but will minimize my usage as much as possible. I recently started making Ecobricks, which provide insulation for new homes in developing countries; Bristol even have their Ecobrick bins and I’m sure other cities will follow suit! What is your advice for other people trying to cut down on single-use plastic? Emily: With such a wealth of information on the internet in regard to the detrimental effects of single-use plastic to our environment, and easy ways to combat our individual plastic footprint, I would really encourage others to take advantage of this information and have a quick look to see what easy little changes they can make to help the cause. Charlotte: Keep at it, but be realistic. We’ve definitely still got a long way to go before the general public can realistically eliminate single-use plastics; at the moment, unless you can dedicate lots of time (and money) to it, it’s unlikely that you’ll achieve a 100% single-use plastic free lifestyle. I would therefore do everything you can yourself but continue lobbying your MP/supermarkets to crack down on single-use plastics and to seek sustainable alternatives! The UK’s largest reuse marketplace, connecting businesses with charities and people to give new life to unwanted stuff. We collect data on the social, economical and environmental impact of items given.